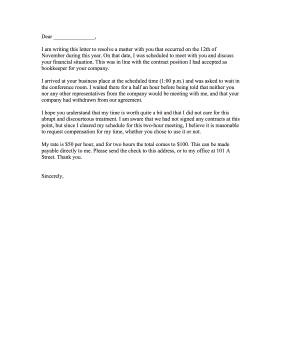 Contractors who are not paid for their time and work can use this complaint letter to demand compensation. I am writing this letter to resolve a matter with you that occurred on the 12th of November during this year. On that date, I was scheduled to meet with you and discuss your financial situation. This was in line with the contract position I had accepted as bookkeeper for your company. I arrived at your business place at the scheduled time (1:00 PM) and was asked to wait in the conference room. I waited there for a half an hour before being told that neither you nor any other representatives from the company would be meeting with me, and that your company had withdrawn from our agreement. I hope you understand that my time is worth quite a bit and that I did not care for this abrupt and discourteous treatment. I am aware that we had not signed any contracts at this point, but since I cleared my schedule for this two-hour meeting, I believe it is reasonable to request compensation for my time, whether you chose to use it or not. My rate is $50 per hour, and for two hours the total comes to $100. This can be made payable directly to me. Please send the check to this address, or to my office at 101 A Street. Thank you.